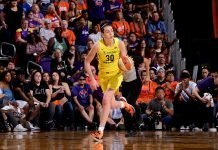 The NCAA Women’s Basketball Rules Committee is exploring opportunities for teams to experiment using the international three-point line in exhibition games before the start of the 2018-19 season. The NCAA’s statement on today’s Supreme Court wagering decision. The NCAA has reached a 10-year data collection and distribution deal with Genius Sports, a sports data and technology company headquartered in London. Former Ole Miss rebel Promise Taylor has transferred to arch rival Mississippi State. South Carolina is Clemson graduate transfer Nelly Perry’s new home. Teach, love, inspire: The passion with a purpose behind Stephanie Gaitley’s Fordham program. George Mason coach Nyla Milleson has a new contract extension good through 2020-2021. Colleen Mullen is UAlbany’s new head coach. Shereka Wright joins Vanderbilt as associate head coach. LaSondra Barrett is a new assistant coach at Louisiana Tech. UTEPS’s new assistant coach is Kayla Weaver. Danielle Page is Toledo’s new assistant coach.